Amanda has been passionate about animals all her life and particularly interested in the relationships between animals and their owners. Fifteen years ago Amanda started running classes at Fourways Veterinary Hospital with Dr Donne Roberts (Wells), a veterinarian who specialised in animal behaviour. Subsequently Amanda attended puppy class instructor courses offered by Dr. Quixi Sonntag and a Canine Culture Obedience Instructor course offered by Shannon Mckay. 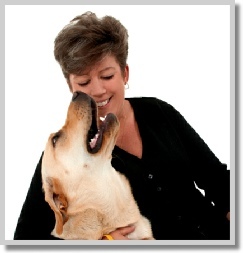 Amanda trained dogs and handlers at beginner to advanced level while continuing to do puppy classes. Amanda constantly keeps up to date on latest training methods and thinking through extensive reading and interacting with colleagues. Amanda is dedicated to building a relationship between the handler and their puppy through her puppy classes and while her classes are fun and interactive, the importance of the classes are not forgotten. Amanda recognises the importance of this age in the puppy and is eager to ensure that the handler uses this time to his/her best advantage to ensure a well balanced adult dog. A badly trained dog does not go out much and Amanda knows through effective training that dogs enjoy a much more balanced and well rounded lifestyle. Amanda has a husband, three dogs Sam (Golden), Stryder (Lab x Golden) and Gryphon (Golden) and nine cats.